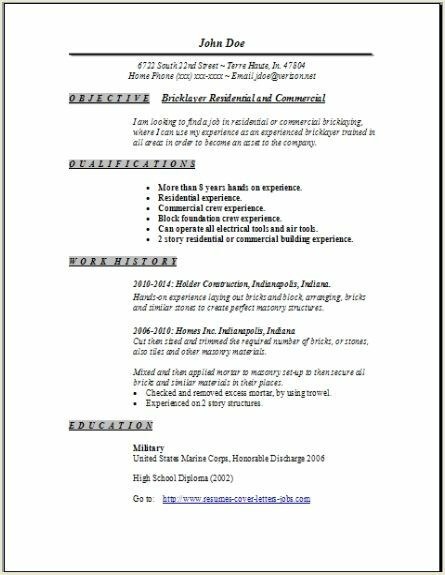 I am sure that all your friends would be interested in knowing where you found these great completely pre-formatted resumes, so do them a favor and just e-mail them this resume page. Just go ahead and use the bookmark that you will find below. When you do download--after your file opens, then choose save as--where-save on Desktop--leave the file name exactly like it is now. 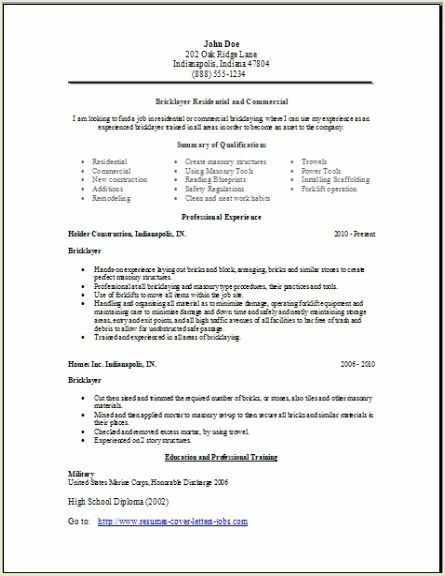 When you want to start editing this resume, you should be able find it very easily later. Use these 3 bricklayer resume formats we have prepared for you, by completely editing them with all your personal job details right after you get them downloaded to your desktop. The fastest and easiest way to get this done quickly is to backspace through our example one sentence at a time, and then replace what we have there with your own job specific detailed information. After you have completed that task, you will then need to compare all three, choosing one you think you might like the best. It is oh so very easy. 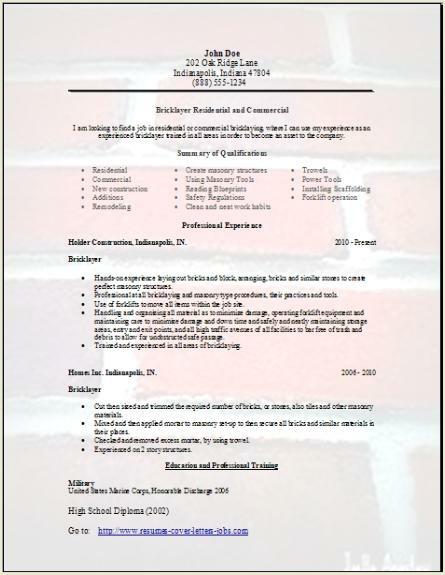 I like the bricks myself, anyway this is the simplest, fastest and time saving way to create your new bricklayer resume. This process will take only minutes. Especially if you have written down your information ahead of time on a resume draft. Although some bricklayers learn their trade by an apprenticeship program, most learn their bricklayer skills while working on the job, the previous take 1- or 2-year masonry programs at a technical school. Get your high school diploma or its equivalent if you would like to participate in an apprentice type of program. What Training Do I Need to Be A Bricklayer? Basic masonry is usually offered in one or two year programs at most technical schools. The credits that you earn will usually count and can be applied towards an associate’s degree if you would wish to get one. A lot of people will take the course before looking for a job to be hired at, and some will take them at a later date as on-the-job training possibly offered by the employer. A 1- to 2-year apprenticeship is the best way to succeed at getting into this trade. For every year you are in the program, an apprentice needs to complete a minimum of 144 hours of technical instruction that is related to the field of study and also 2,000 hours of paid on-the-job type of training. Apprentices will learn all the construction basics like blueprint reading; mathematics, which will include measurements, volumes, and different mixing proportions; any building code type requirements; and also safety and good first-aid practices. You will be considered a journeymen mason able and competent to perform all the various tasks on your own after completing and passing a professional apprenticeship program. Training is available at technical institutes, quite a few community colleges, and also through the Armed Forces. Make sure your bricklayer resume has all these certificates listed that will help along your hiring process.